All of us here at the Jurassic Coast Trust are really looking forward to Dippy’s arrival in Dorchester next February. 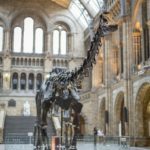 Here are 8 incredible Dippy Facts that you should know before going to visit him in Dorchester! Dippy is a massive skeleton, measuring 21.3 metres in length, and over 4 metres in both width and height. He will manage to squeeze into Dorset County Museum’s Victorian Gallery by mere centimetres! Constructing Dippy is an epic undertaking, featuring 292 bones which need to be assembled in the precise order. Dippy is a specimen of Diplodocus Carnegie, a herbivorous dinosaur from the Jurassic period, around 150 million years ago. 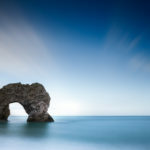 At that time, the Jurassic Coast was underwater! Some scientists think that Diplodocus may have had small spines on their tails and backs to ward off any potential predators. Diplodocus lived for 70-80 years, similar to modern-day elephants and humans. 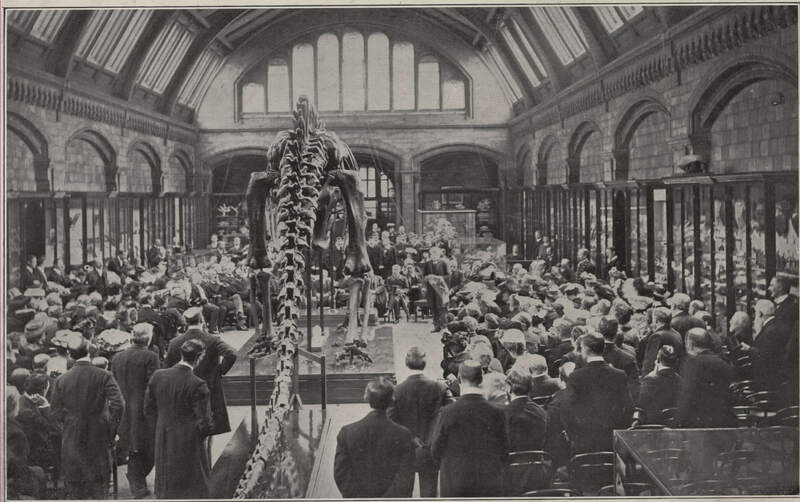 Dippy’s skeleton was first unveiled at London’s Natural History Museum in 1905. 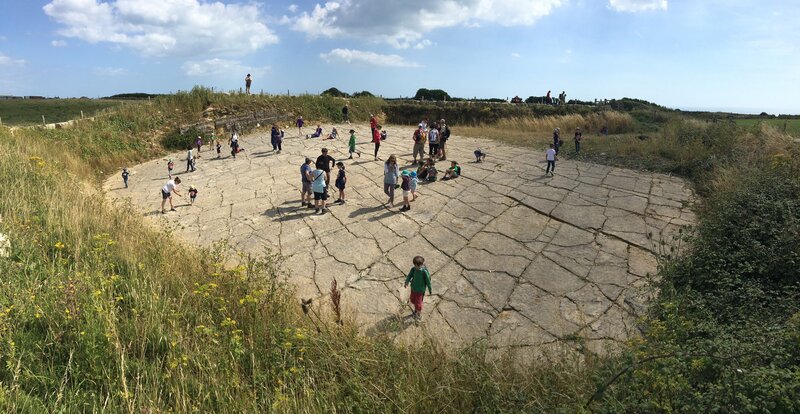 Here on the Jurassic Coast, you can see footprints made by Dippy’s sauropod relatives, at Keates Quarry in Worth Matravers. Entry to Dippy on Tour is free, and you can book your tickets through Dorset County Museum’s website. Free single-use entry to all of Dorset County Museum during Dippy on Tour. Valid for up to 2 adults and 4 children. Valued at up to £18. Visit Dippy whenever you like. Our Go Jurassic! 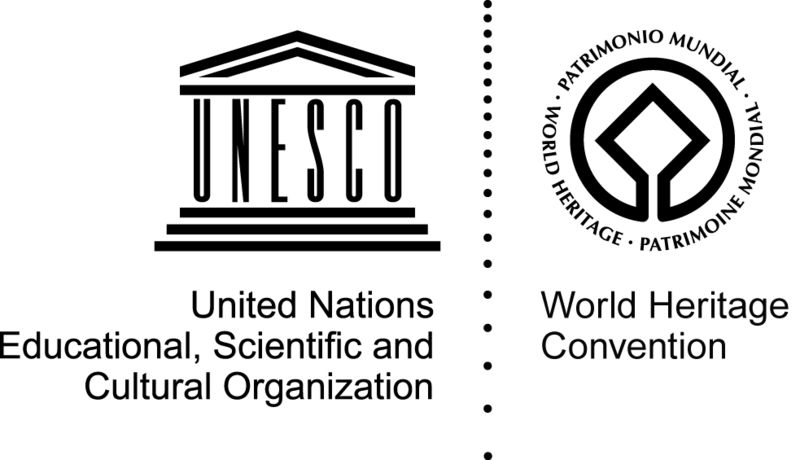 Rangers families can validate their free entry to Dorset County Museum during Dippy on Tour at any time during the museum’s opening hours, without needing to book a time-slot in advance. 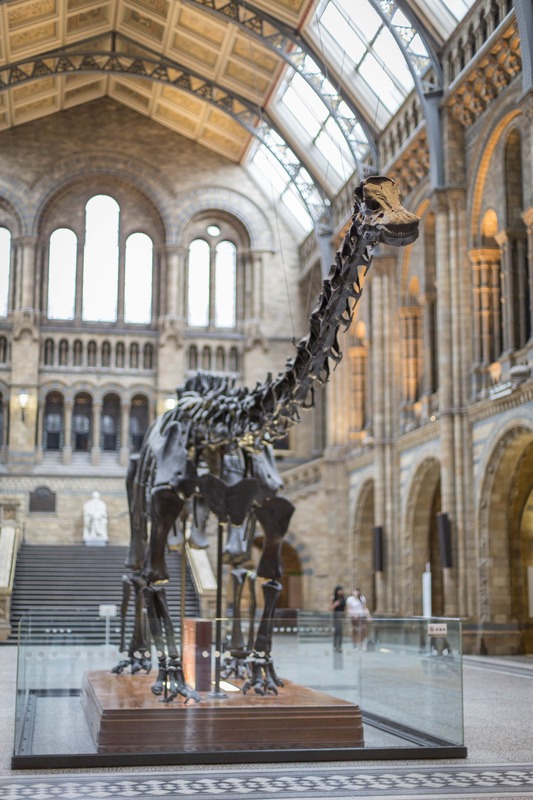 Exclusive Behind-the-scenes tour of Dippy. Our Go Jurassic! Rangers families will be invited to an exclusive sneak peek at Dippy in early February 2018, before he’s revealed to the public. The opportunity to book onto our two Dippy Sleepovers before they’re made available to the public. 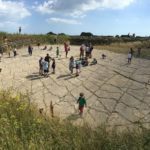 Visit our Go Jurassic! page for all the details and to sign up. Dippy at the Natural History Museum, London. 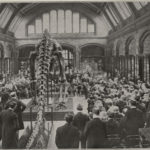 Dippy’s unveiling at the Natural History Museum in 1905.